…to rediscover serenity by stepping back into Nature. Shouldn’t the way we build a trail be just as calming? Jeremy Early Trailworks creates hand-built, low-impact trails for residential communities throughout the Southeast. 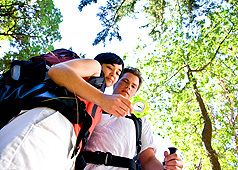 Our trails traverse the landscape from the Blue Ridge Mountains to the coastal plains. Read highlights and view photos of our recent projects to see just how easy stepping back into Nature can be. "Our trails have become a shining point in both our communities and have undoubtedly enhanced our homeowners' lake experience."